Press outlets in Cambodia have carried many stories about the country’s victory over the Khmer Rouge genocidal regime 38 years ago, highlighting Vietnam’s role in that triumph. The Kampuchea Thmey Daily quoted President of the Cambodian National Assembly Heng Samrin, who is also Honorary President of the ruling Cambodian People’s Party (CPP), as saying that the rule of the Pol Pot genocidal regime was a dark period in the country’s history. He underlined his country’s changes in all fields since the victory was made on January 7, 1979, noting that without that triumph, the current achievements would not have been attained. The story also repeated his appreciation of enormous assistance from Vietnamese volunteer soldiers who responded to the call of the Kampuchean United Front for National Salvation, an organisation representing the Cambodian people’s will, in the struggle against the Khmer Rouge. News websites of Cambodia such as the Voice of Democracy (VOD) and the Women’s Media Centre of Cambodia (WMC) also posted similar stories which read that the historic victory on January 7, 1979, was partly attributable to Vietnam’s support. 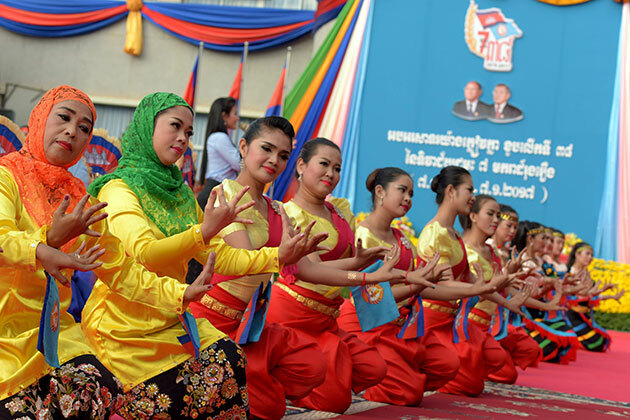 At a recent celebration of the triumph, Cambodian Prime Minister and CPP President Samdech Hun Sen said that glorious victory timely saved Cambodia and helped its people retake all human rights and become the master of their own life. Thanks to that victory, the country closed the darkest chapter in its history and opened a new era of independence, liberty, democracy and social progress, actively contributing to peace and security in the region, he noted./.